200 years ago, Napoleon’s dreams of a new European order dominated by France died on the battlefield, in Waterloo. As we commemorate the anniversary of this epic battle, we can also draw some parallels with today’s troubled times. This article was first published on the blog Reshaping Europe. Europe, in the first part of the nineteenth century, was torn apart by a long war between its great powers: France, Britain, Russia, the Austrian Empire and Prussia. Nowadays, Europe remains divided. Tensions persist as well. French, Brits and Germans, among others, still compete for power and influence in Europe. Yet, if battles occur almost daily in Brussels, just a stone’s throw away from Waterloo, they are now political – not military – battles, as they take place in a united and peaceful Europe. War has been almost entirely banished from the European continent. Yet, Russia’s aggressive rhetoric and actions in Ukraine threaten this state of peace, which is perhaps more fragile than many thought. Russia’s current policy vis-à-vis Ukraine is strikingly reminiscent of Tsar Alexander’s claims over Poland two centuries ago. His territorial ambitions almost derailed the peace process then, and put Europe on the brink of war, again, during the Congress of Vienna – the major diplomatic conference that took place between September 1814 and June 1815, following Napoleon’s first abdication. It took adroit diplomatic manoeuvres, notably from France (not unlike these days), to find a peaceful solution. Europe is no longer the centre of gravity of international relations, but a number of parallels can still be made with the world we live in today. In the 19th century, France was a revisionist power, as Napoleon’s voracious appetite destabilised the European order. As a result, the other great powers coalesced against him to defend the status quo, which is a system based on monarchy and balance of power. Today’s revisionist powers are non-European. They are China, Brazil, India, South Africa or Russia. Individually and collectively, for instance under the BRICS format, these emerging powers contest and challenge the current global order dominated by the ‘West’, i.e. the US and European countries. So far, it seems that these emerging powers are seeking to pursue their revisionist objectives mostly through peaceful means. For instance, they seek more representation and power within the multilateral system. They also try to project their influence worldwide through soft power means essentially, leveraging their growing political, economic and cultural presence in all parts of the globe. Tensions and conflicts remain possible, as in Ukraine today and perhaps in the South China Sea tomorrow. 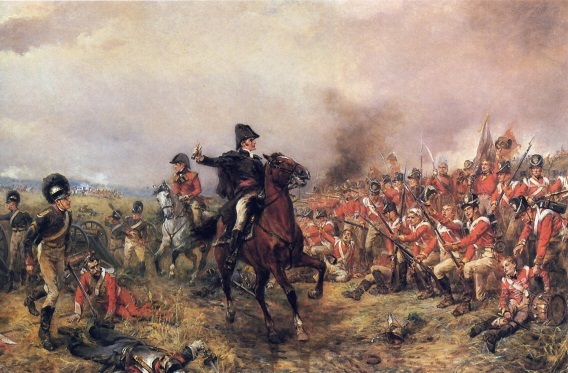 Yet, war among great powers – a 21st century Waterloo – remains an unlikely perspective. And it is the responsibility of today’s status quo powers to ensure that this does not happen. The fate of early nineteenth century Europe was determined on the battlefield – twice (in March 1814 and June 1815) – but it was enacted during the Congress of Vienna. The whole of Europe converged to the imperial capital, following the first abdication of Napoleon, with a view to negotiating the terms of the new order. This was one the first such major diplomatic gatherings, whose objective was to restore order through negotiations and compromises rather than war. The Congress almost failed in this objective several time, notably after Napoleon’s return from his exile in Elba. But the victory in Waterloo was eventually the victory of the ‘Congress system’, a system based on balance and coordination among great powers. Two centuries later, the spirit of the ‘Congress system’ may not be entirely dead. Coordination among great powers remains a key feature of contemporary international relations, through the United Nations Security Council for instance. Furthermore, multilateralism has largely evolved, to become more inclusive and specialised. The multilateral system itself is far from perfect. Its legitimacy and effectiveness is often challenged, notably by emerging powers. Yet, most contemporary challenges, such as climate change or international terrorism, require a globally coordinated response. In the 21st century, an enduring multilateral system must adapt to these new realities. Finally, the Final Act of the Congress ushered in a new order in Europe. Throughout history, similar treaties have often marked the twilight of an era and the dawn of a new one, such as the Treaty of Westphalia (1648), Paris (1919) or Yalta (1945). In contrast to this, there has been no treaty forging the principles of the new global order since the end of the Cold War. Nowadays, the international system is undergoing fundamental transformations, under the pressure of globalisation, the rise of new powers, the growing influence of non-state actors, etc. As a result, the ‘old’ order is increasingly contested, but no alternative has been offered yet, hence creating tensions and uncertainty. A new ‘Congress of Vienna’ seems unlikely. Instead, the new order is more likely to be negotiated piece by piece, over a much longer period of time. This is even a necessity. One should not read too much in these historical parallels. In international relations, history helps poorly to predict the future. Yet, on this anniversary of the battle of Waterloo, we should remember that more than 10,000 soldiers died and 40,000 were wounded during just one battle, and an entire continent was destabilised due to one revisionist power. 200 years later, new revisionist powers are rising. It is how Western ‘status quo’ powers deal with them and address their claims that will determine the dynamic of the new global order.